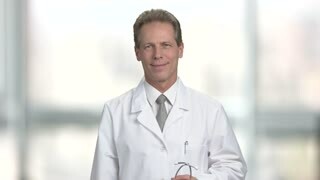 Middle aged smiling male doctor. Portrait of a smiling middle aged doctor in lab coat with stethoscope around his neck, hromakey background. Male medicine doctor puts on stethoscope on his head and listen. Physician starting to exemine your heart. Bright abstract windows blurred background. Smiling doctor in protectove mask put on stethoscope on his neck. Wear medical equipment. Bright checkered framed windows background.